Date: Late 1st century B.C. – 1st century A.D. 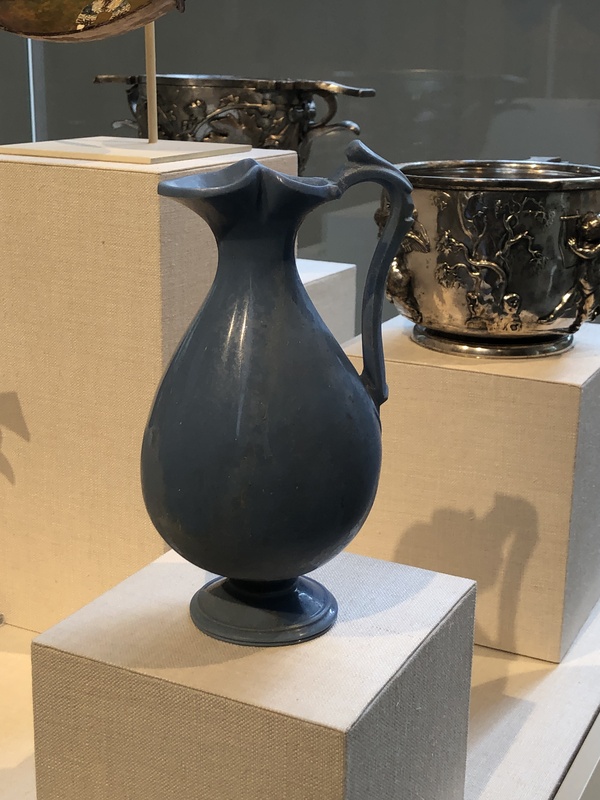 Remarks: This very important and beautiful elegant jug, whose shape imitates that of a metal vessel, shows how quickly the newly founded Roman glass industry mastered its medium. 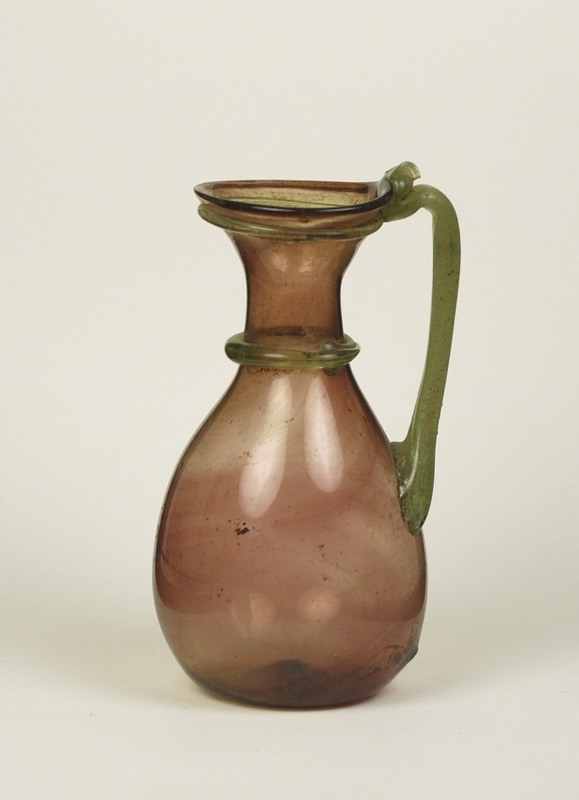 It represents a transitional phase in glassmaking, when casting, cutting and blowing techniques were used. 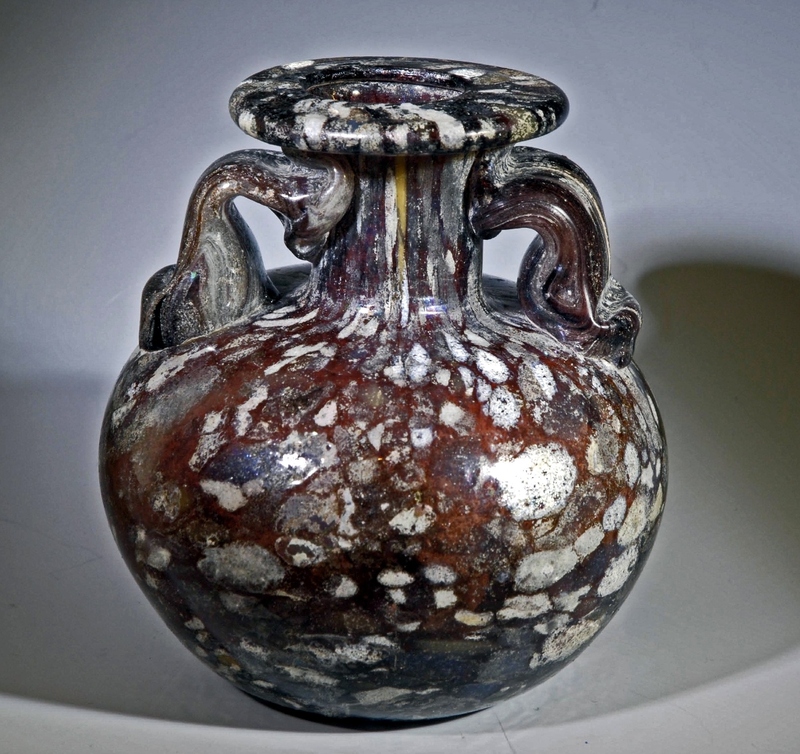 The jug’s handle was cold-carved and the base was cut on a lathe, but the body seems to have been blown. 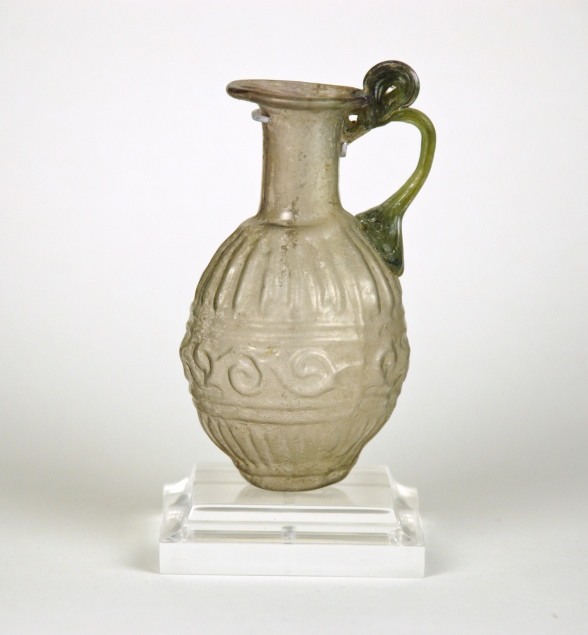 A similar combination of techniques is found on some examples of early Roman cameo glass, notably the British Museum’s Portland Vase. 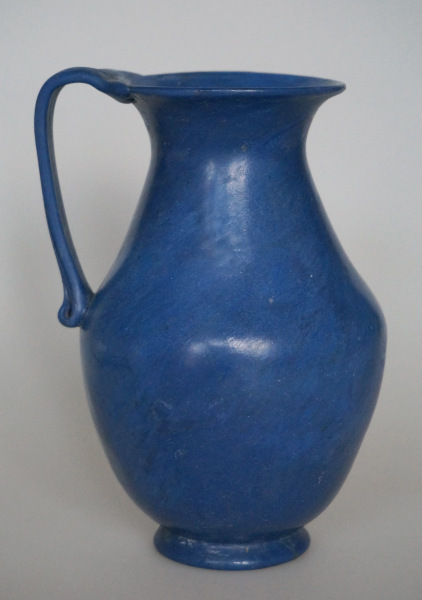 The techniques casting, cutting and blowing used to make this jug along with its unusual opaque blue color makes it very rare. Below are two other vessels with these similar properties on this blog. Description: The color of the glass aryballos is aubergine with splashes of white, blue and yellow glass. Description: Aryballos of thin translucent blue glass with flecks of opaque white color, this so called splashed glass is a much more elaborate and earlier product than the well- known aryballoi. 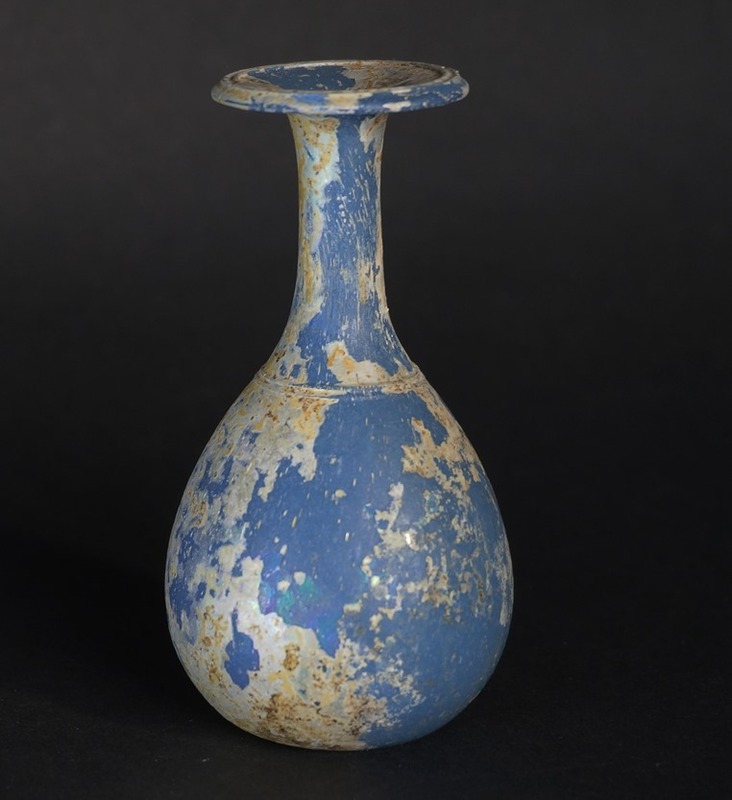 This oil flask has a globular body resting on a flattened base, a cylindrical neck. The rim folded outward, downward, upward and inward to form a collar-like rim. Two handles applied on the shoulder, drawn up and attached to the neck. The handles in translucent light blue glass. The bottle as a whole decorated with random ”splashes” of opaque white glass. No pontil mark. 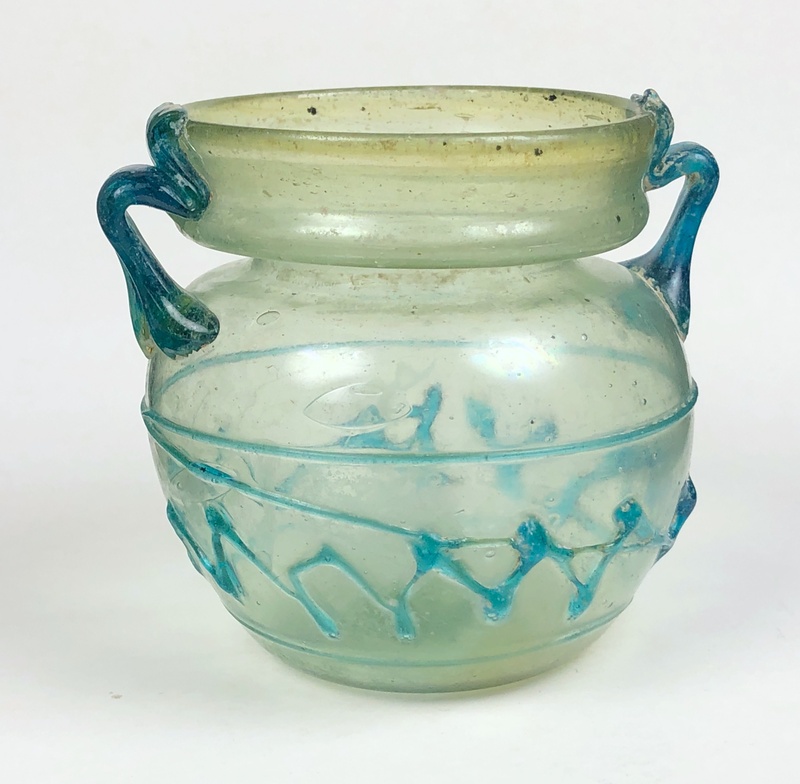 Remarks: These splashes were produced by rolling a bubble of (blue) glass over a marver covered with shards and chips of colored (white) glass. The bubble of glass mixed with the shards and chips would then have been reheated to make it ready for blowing. The chips melt flush with the surface and change shape when the glass expands; round at the greatest diameter, elongated vertical in the neck. ”It has been suggested that this technique may have been developed to imitate the more costly mosaic glass. An exceptional example of a rare technique of decorating ancient glass. 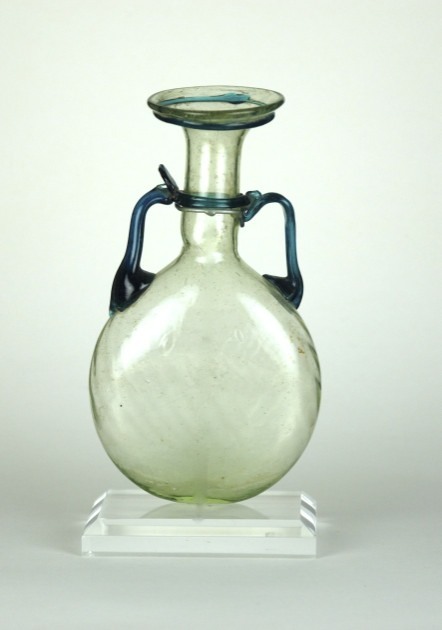 Many of these glasses are found in the Aegean area and in South-Russia.” (Whitehouse 1997) On the backside of the stand a brown-colored paper label with the following text: ”Amphora, röm. Kaizerzeit 1 Jh post – OP S 141 rejo’’. Late 2nd – early 1st century BC. Near East (Alexandria?) or Italy. H= 8,6 cm. D max= 19,3 cm. D rim= 11,2 cm. D base= 7,6 cm. Classification: Andrew Oliver Jr. 1967: Type A. Condition: Intact. Tiny chips to upside handles. Technique: Cast, ground, lathe-cut and polished. Description: Semi-translucent colorless glass with a yellowish grey tinge. The hemispherical body on a low outsplayed ring foot. Rim cracked off and ground. The integral ring handles with flat horizontal upper and down-curved lower plates, aligned with the rim above. Vertical wheel-cut grooves on body where upper handles merge with the vessel’s rim. 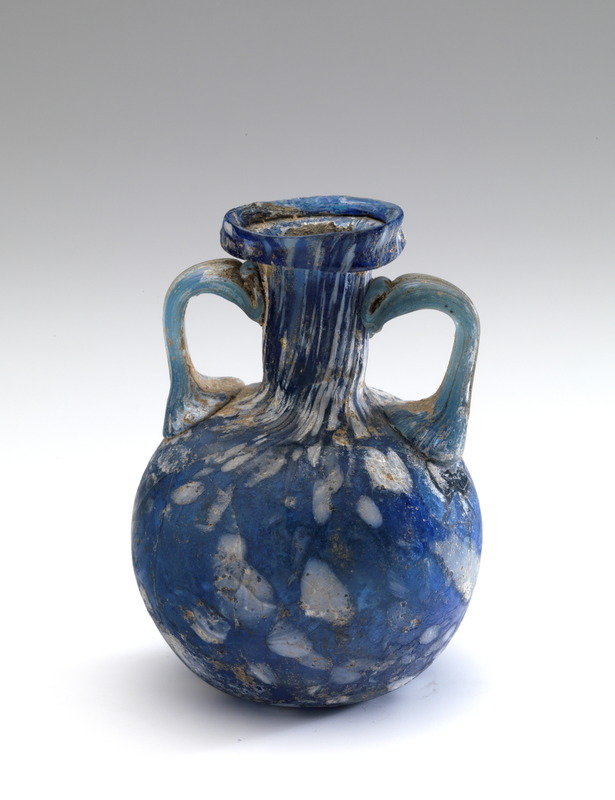 Remarks: Glass skyphoi were cast in molds in one piece with their handles and feet. On the vessel’s cooling, the orifices in the handles, their further details and the feet were finished by chiseling and cutting. Subsequently the vessel was ground and polished on a lathe. 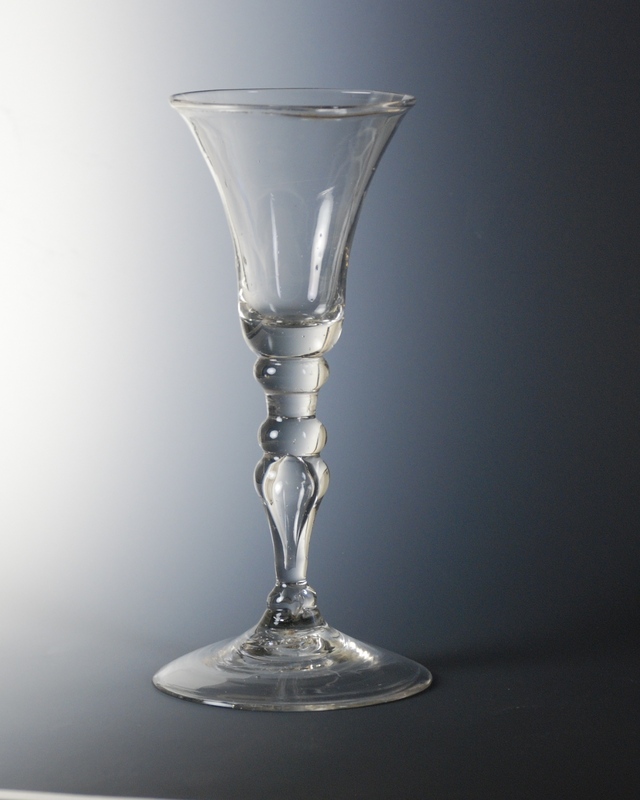 Colorless glass was often chosen deliberately to imitate rock-crystal. The handles were designed to be held with the thumb, forefinger and middle finger. Most skyphoi were made from metals: gold, silver or bronze. Published: Christies 8 June 2004, No. 11. References: Kunina 1997, Hermitage Museum, No. 57., Saldern 1968, Boston Museum, No. 10. ,Christies 12 June 2002, No. 170. Arveiller-Dulong 2000, Louvre Museum, No. 208., Fortuna Fine Arts 2009, After Twenty Years, No. 10. Technique: Blown into a two-part mould with two vertical sections (MCTVII) and separate base plate; vertical mold seams from rim to base through palm leaves. Rim cut off and unworked, slightly out-splayed. 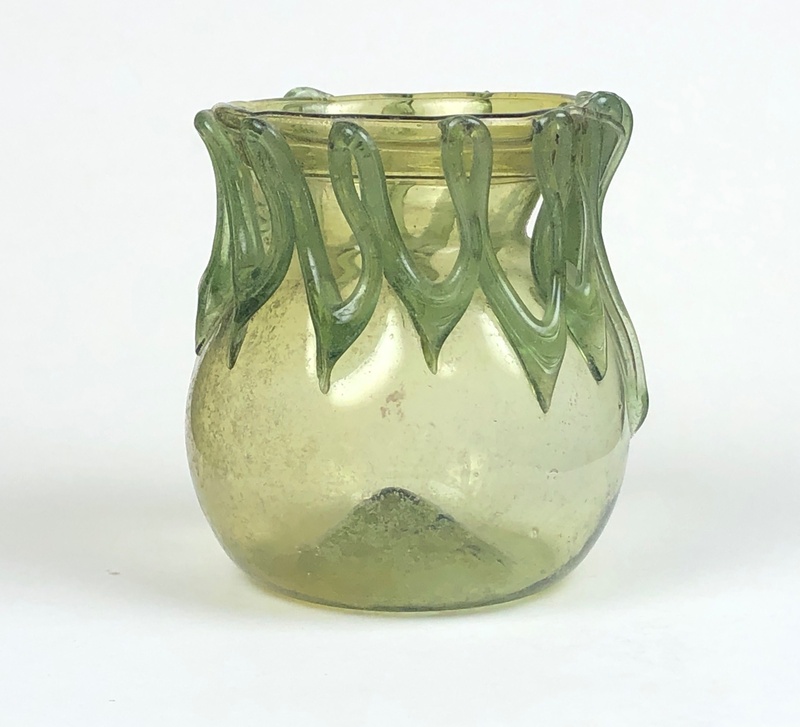 Description: Cylindrical cup of translucent manganese colored glass, with mold-blown inscription, two diametrical opposed palm fronds and six schematic wreaths. The body with three registers divided by horizontal ribs, the upper and lower each with six stylized wreaths, consisting of two concentric circles joined by radial lines. The central register with a Greek text: ΛABE THN NEIKHN, meaning: ‘Seize the Victory’, the N formed backwards as can be seen on many of the existing examples in this group. Base flat with a barely perceptible sunken dot in the center surrounded by a slightly raised ring. Condition: Thin glass (0.15-0.20 cm) with one hardly visible crack. Two very small chips and one larger broken off from the rim. Mold-relief medium crisp. 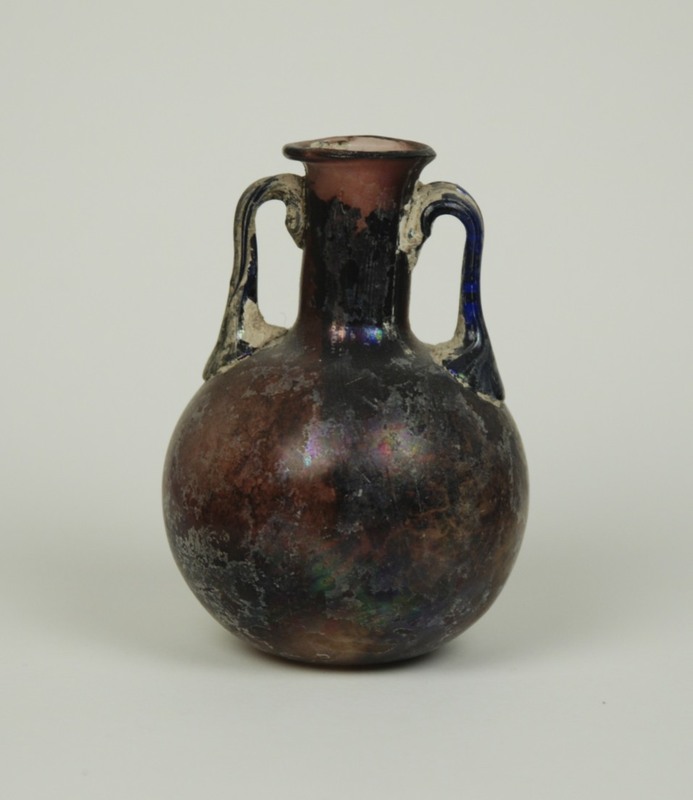 Sand encrusted on the inside and outside, with faint weathering and iridescent film on the side and base. 1. Donald B. Harden distinguishes, in his article in the Journal of Roman Studies, 19351, three sub-types of cylindrical Victory Beakers, following his description the example in the Augustinus Collection can be attributed to group K1iii, with the exception that the letter B is connected to the ridges above and under the inscription and that no knotted ends are visible below each of the six wreaths, which is remarkable and makes this example possibly unique and belonging to a different category. 3. David Whitehouse remarks in the catalogue of The Corning Museum of Glass3: “Beakers inscribed: ‘LABE THN/NEIKHN’ are fairly common and this (the one in the museum) is an example of the commonest type, in which the inscription is written in a single line.’ He also brings up: ‘Two variants occur: one with the letter N of THN formed correctly and the other with a backward N.’ Whether examples with the N placed in normal position form a minority or not, has not become clear. Provenance: From a private dutch collection, first publication. Reference: Metropolitan Museum of Art New York, Harden 1944-5, p.94. Yale University Art Gallery, Matheson 1980, p.53, no 134. The Toledo Museum of Art, Stern 1995, pp 99-100, no 4 and no 3.Corning Museum of Glass, Whitehouse 2001, vol. 2, no 491, p.26. A Trulla (Latin) is a pan with a long horizontal handle. 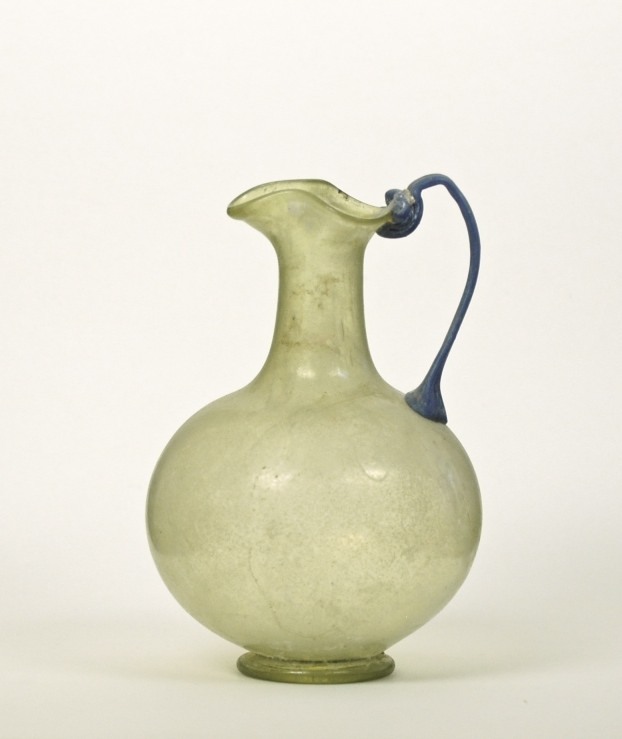 Vessels of this type, made of both metal and glass, were widely used Roman world during the 1st century AD. 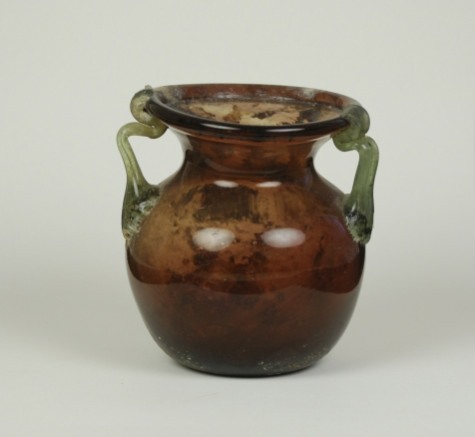 It has been suggested they were used for drinking, serving liquids in ritual ceremonies or perhaps even bathing. 3.4. 5. 6. 7. 8. 9. The authenticity of this last vessel may be questionable. 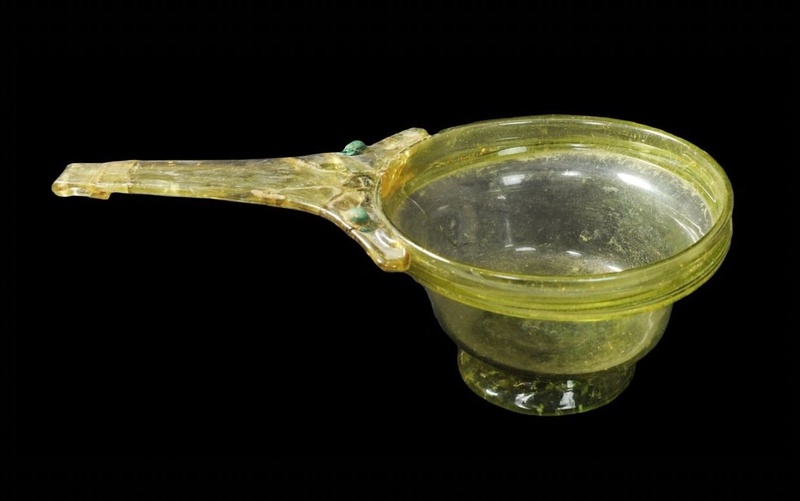 It appears to be a composite of a 4th century Egyptian bowl with a handle of a Trulla applied at a later time. Today, we think of architects as people who design buildings, construct skylines, and help create the visual identities of our cities and towns. But at the turn of the 20th century, a group of progressive architects also designed all aspects of interior decoration. They rejected mass-produced objects that simply imitated older styles, believing their role was to seamlessly integrate craftsmanship and modern design into daily life. 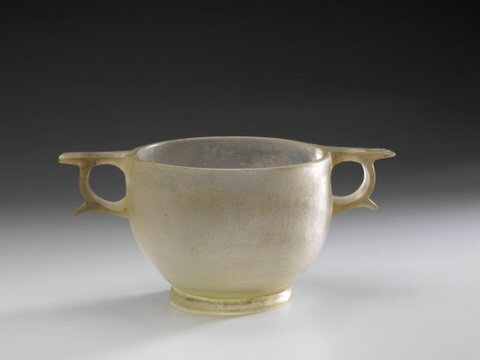 Glass, furniture, Ceramics, textiles, books, fashion accessories, and even silverware played an important role in completing this new artistic vision. Glass Provided opportunities to explore modern aesthetics. 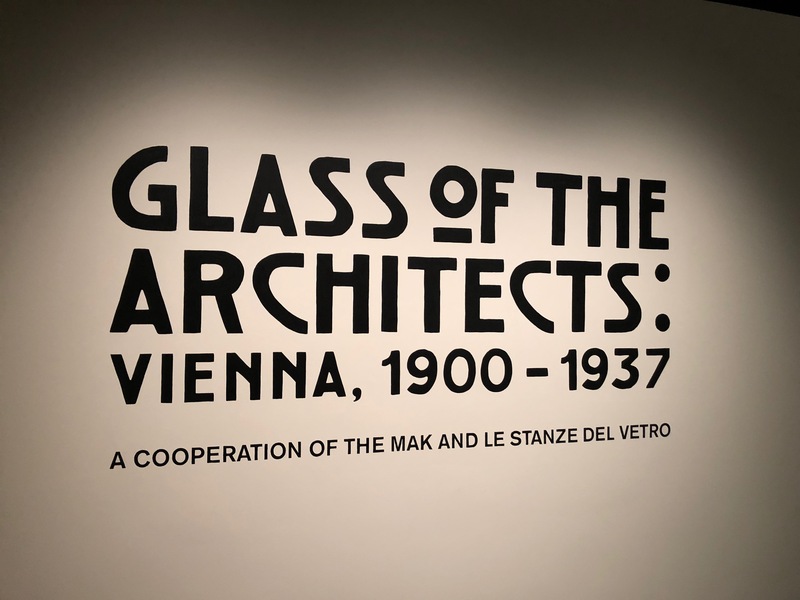 Building on existing traditions of glassmaking and leveraging networks of technical and design schools across Central Europe, this new aesthetic in glass was promoted on a global scale at exhibitions and by manufactures and retailers. Austrian glass from 1900 to 1937 emerged from a confluence of ideas, individuals, and cultures, capturing a spirit of modernity. This is the opening statement from a new show call: “Glass of the Architects“(active link) at the Corning Museum of Glass. This post does not do justice to this excellent new exhibition. It is must see show.